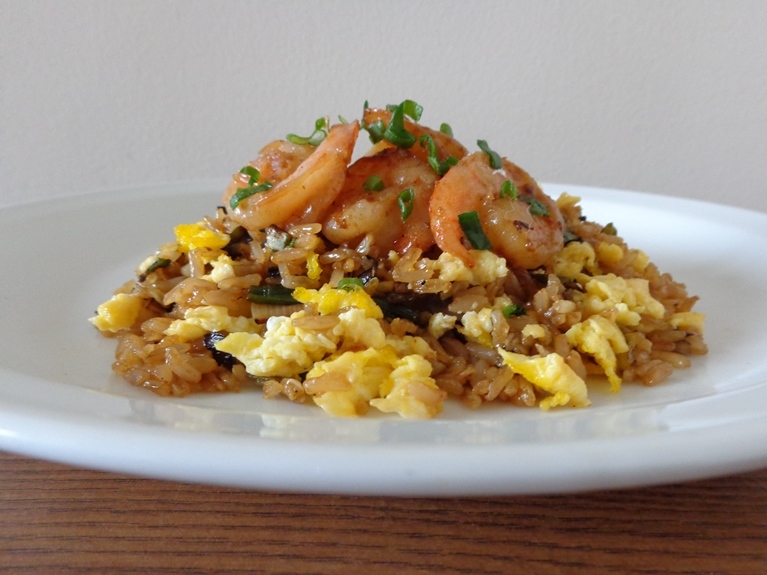 This Brown Scallions Fried Rice with Oy-Butter Shrimp recipe was developed by VeeTee member Hidemi Walsh. Here's her story behind this recipe: I love oyster sauce and know the combination of oyster sauce and butter makes so tasty flavor. I added those to my fried rice. In Japan, there is Negi which is a type of long onion and in between scallion and leek. When you cook negi until very browned (not burned), it brings out wonderful savory flavor. Whenever I made fried rice, I always added negi to my fried rice when I lived in Japan. Unfortunately, I can’t find negi in my town now but tried with scallions. I figured it worked! Just smaller than negi but the same flavor is brought out and delicious fried rice was made! 1. Chop scallions. Peel and mince garlic. 2. In a nonstick skillet, heat 1 tablespoon olive oil over medium heat. Add eggs to the skillet and make scrambled eggs. Put the scrambled eggs on a plate. Then add the rice to the same skillet and stir fry for 2 minutes. 3. In another large nonstick skillet, heat 1 tablespoon olive oil over medium-high. Add scallions to the skillet and cook stirring frequently until browned, but not burned. Reduce heat to medium then add garlic to the skillet and cook stirring constantly until garlic turns lightly brown. Stir in the rice and stir fry until combined. 4. Stir in 2 tablespoons oyster sauce and 1 tablespoon butter until combined. Add the scrambled eggs, salt and black pepper to taste and toss to coat. Put the fried rice on two serving plates. 5. Make “Oy-Butter Shrimp”. In the same skillet, melt 1 tablespoon butter over medium heat. Add shrimp and cook until shrimp are cooked through. Stir in 1 teaspoon oyster sauce until combined. 6. 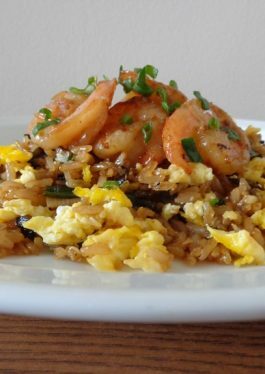 Put the shrimp over the fried rice (4 shrimp for each) and sprinkle with chopped scallions over the shrimp for garnish. Tips: Sprinkle with chopped scallions over the shrimp for garnish.